Like nearly everyone in southeastern Virginia, I love leaving the heat and humidity behind when fall comes around. Also, I’m really glad to get the kids off to school and get back in a routine 😉 Throw in a couple of pumpkin doughnuts, and I am not mad at October AT ALL. Fall has me rethinking about the welcoming “vibe” my porch is giving off, too. Does my porch have a half-dead hanging fern that never gets watered because the boys can’t reach it? Are there mud-crusted shoes by the door that I didn’t want in the house? Is there a broken Nerf gun on the bench? The answer to all of these questions is YES. Not a good fall look. If your porch looks anything like mine, read on to learn how to create welcoming first impression. Sweep off the whole porch really well! If you have a door mat, sweep it or hose it down depending on the material. Sweep under and behind any furniture and planters. Sweep out any high corners for cobwebs. Remove dead plants or dead foliage and flowers. Wipe down your pots to remove grime. Inspect your flag. Is it still in good condition? I guarantee you that you will love coming home to your cozy (and clean) autumn porch. Although we want our homes to welcome guests and visitors, it’s so vitally important that our homes speaks to us as well! A few simple changes can help give you a sense of calm when you walk through your door at the end of a long day and help you embrace the season in a way that feels personal. It’s been soooo nice here the past couple of weeks and I’m finally working on getting my house and porch ready for the season. In fact, the gutters are getting a good cleaning and the house is being power washed as I write this! Also…I have baby birds in my hanging fern! They JUST hatched overnight and I’m so excited. They are the tiniest little finches and I love watching them grow up every year. So in the spirit of porch sitting, ice tea drinking and bird watching, I created a front porch design board in the New Traditional Style. What’s New Trad, you ask? (that’s what we say in the business by the way ;/) I like to describe it as your very stylish grandmother’s home. It’s refined but never stuffy. Polished and but also relaxed. New Traditional takes the best of classic furniture shapes and lines and tweaks them to fit today’s way of living. Always comfortable, a bit eclectic, with modern patterns and clean lines. Trends are used with caution and only those with staying power make the cut. Do you consider yourself a “New Trad?” No? I’ve got three more porch plans in my pocket for the upcoming weeks. Look out for modern, bohemian and farmhouse throughout the rest of May and June. Need help planning your porch or another space in your home? An in-home consultation can give you just the jump start you need. Or let me do all the work and choose a full-service design plan. After a little summer blog break that somehow seeped into fall, I’m back with a dining room design board since it’s that “gathering” time of year. Even if you don’t host a big sit-down meal around the holidays, I think many of us see autumn as a time to spruce up a bit and transition our homes from summer to a quieter time. Having dinner in the dining room, even in the middle of the week, is a wonderful way to reconnect as a family and enjoy your home. This plan features Oceanside, Sherwin William’s 2018 Color of the Year.. It’s bold and rich but I contrasted the drama a bit with warm wood tones and textures. I love blue with yellow (well, I love blue with anything!) and Lauren Leiss‘ Live Paisley fabric looks so pretty with the paint color. Lauren used the fabric in the Southern Living 2016 Idea House master bedroom it was amazing. I love vintage prints and I can never get enough birds, so I chose two prints of etchings by Mark Catesby, an 18th century English naturalist. The owl is a nod to the season and the blue and yellow tones in the artwork play well with the fabric and walls. I chose the lamps for their textural stone finish and “weightiness.” They look so chunky and sturdy–no accidently tipping these guys over! I love this beautiful, wire-brushed table. A little farmhouse, but the elegant base keeps it from looking too rustic. I chose the same one for a client in a lighter finish and she loves it. Round tables are so perfect for gathering, I think. You can always squeeze in another chair and visually it’s nice to have a piece without hard edges in a room. The chair’s slim arms slide easily under the table and the upholstered seat means people will want to linger. I like using natural, sort of “weathered” accessories and vintage object and Adry Vintage has some great pieces. I love the way she styled this bowl. isn’t this mirror amazing? The antique brass finish and the carved edge are so pretty against the blue walls. A unique interpretation of a basic shape always keeps a room interesting. The table, chairs and mirror are available through the trade so if you’re interested in them, contact me for more details. I love designing dining rooms and it’s the perfect time of year to make a change! Don’t Miss Home Decor Sales! If you’ve been wanting to spruce up your home for summer, Memorial Day weekend is a great time to shop. From furnishings to throw pillows to accessories, it seems nearly everything for the home is on sale! Below I’ve linked a few of my favorite things from my favorite shops at can’t-miss prices. Wisteria is offering 25% off of everything with code salut20. I love this scalloped bone inlay stool. Ballard Designs is offering 25% of orders of $500 or more and 20% off of everything else. No code necessary! Long, narrow consoles like this one are always great, especially in a smaller space. I love the x stretcher with the ball in the middle. Simple but pretty. $375 is a great deal! Save 20% at Serena and Lily with code AMAZING. Time to get those famous stools you’ve been eyeing forevvvver . Perfect for a stack of books or a plant. Lulu and Georgia is offering a sliding scale discount from 15% to 25% depending on the purchase amount. Use code HEYSUMMER15 (or 20 or 25.) They have loads of on-trend accessories like this blue and white denim pillow. World Market always has the best seasonal outdoor pieces. I love this bar cart! Enter MAYSAVE for an extra 15% off plus free shipping on already reduced prices. Target is having a big summer pation sale with an extra 10% off using code SPRING. They have a huge selection of outdoor rugs like this distressed medallion rug that I love. Um, hello Martha Whiteware Pitcher for $7.99 at Macy’s! Special deals like this are not further reduced, but some items are an extra 15% – 20% off with code SUNNY. Art.com is offering 30% off with no code needed. This 12 x 16 woodblock print by Katushika Hokusai (c. 1834) is only $3.49! So beautiful! Have a fantastic Memorial Day Weekend! Spring and summer always inspires me to refresh my home here and there with new throw pillows, plants or accessories. Often I tend toward natural, textural things and I always love vintage. Lightening up your home decor doesn’t have to be time consuming or expensive! 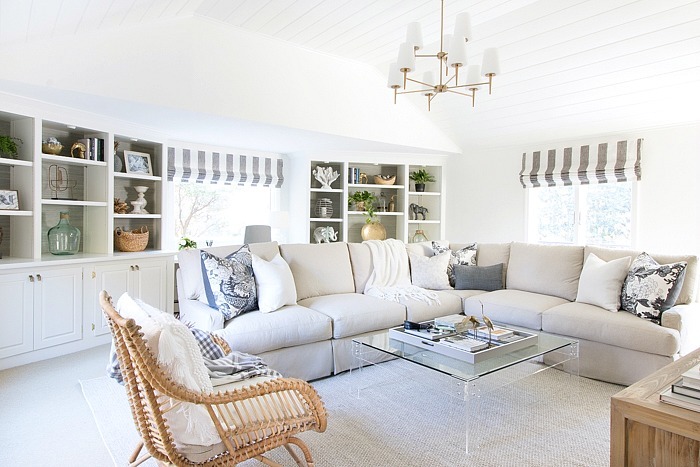 simply swapping out two or three pieces can add a little more life to a room and help create a new, lighter mood. Here’s a few accessories that I’m loving right now and would absolutely use in my home or a client’s space. I love all of these things, but I’m a bit obsessed with the whale bookends. So “rustic cottage on the lake,” right? It’s that time of year! I’ve seen loads of gorgeous, snowy photos on Instagram and I love it! Snow is usually hit or miss here in southeast Virginia, but I’m hoping for at least a couple of snow days. So in the spirit of a white holiday season, today’s living room design board is inspired by a mountain lodge. I combined a log side table, a vintage Persian rug, a stunning chandelier and vintage posters to create a sophisticated yet cozy mix. The paint shade is Benjamin Moore’s Aganthus Green, a cool mossy green with gray undertones from their Classic Color collection. The rug is a gorgeous one-of-a kind Persian from eSale Rugs. The chandelier from Circa Lighting is amazing, isn’t it? Pricey, but I love it so much. I kept most of the accessories lower priced to offset the pricier elements. The pillows and throw are holiday bargains! Love the green threads running through this chunky knit pillow from World Market. I’ve listed all other sources below. The One Room Challenge! Kris’s family room was definitely one of my favorites. I think I’m going to pull the trigger on this. Like right this very moment. Lots of other great things on clearance and an additional 25% off at Ballard Designs! The coolest vintage shop! She carries several sets of baskets like this and I love the way she’s hung and styled them. Buy the whole set and you have a fully decorated wall! I love these abstract brush stroke plates and they’re on sale! Since Veteran’s Day was this week, I found a really interesting article about women in the service who made the ultimate sacrifice. One of the concerns I hear pretty often is “I don’t want my room to be too dark.” People are often afraid to go dark on their walls and the thought of black and navy together? Yikes! Official or not, it sort of sounds like a rule that shouldn’t be broken for fear of…what exactly? I’m not sure, but I can tell you that I probably wouldn’t have considered this combo until fairly recently either. But dark colors, even in a small or dark room, can add depth and help create that longed-for”cozy” factor that lighter colors don’t always offer. Paired together, black and navy can create a lush and sophisticated palette that’s anything but gloomy. Check out these spaces! The secret to making these two neutrals play well together? Add natural elements, like leather, reclaimed wood and natural woven rugs to bring some life into the space. Second? Add bright metals and lighter elements to reflect the light. The design board below features Sherwin Williams Naval, one of my favorite navy paints. It’s a beautiful, true navy, without any gray or green. How do you feel about blue and black paired together? Would you ever try this combo in your home? I’m actually getting ready to paint my dining room blue this week. Can’t wait!! I love using artwork as a jumping off point when I’m crafting a design board. United Thread has been in my favorites list for a long time because her illustrations and paintings are so unique. I’d love to use her work in a nursery project, but until then, I’ve put together this sweet room for a girl of any age. And let’s be honest, after two boys, I’ve had my fill of of Legos, army battles and Minecraft, so putting together a room like this is just plain fun! The Tonic Living draperies coordinate perfectly with both of the art prints and the pale blue walls help anchor the florals and set a more sophisticated tone. Swap the rattan chair for a rocker and the bed for a crib and this plan would work beautifully for a baby girl’s room, too! I’ve been scoping out mirrors lately, both for myself and for a client. In the process, I’ve come upon some truly gorgeous mirrors! Larger mirrors with unique frames can be more expensive, but I think they’re always worth it. An unusually shaped mirror or a frame with detail and texture can add instant personality to a space. I love them all but I’m seriously crushing on the Serena and Lily rattan mirror (#9!) It would be perfect in my powder room…Which one is your favorite?